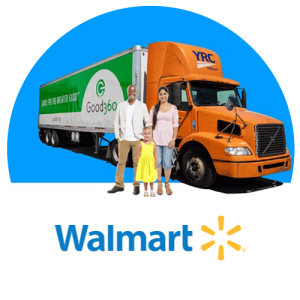 Through the Direct Truckload Program, Good360 partners with Walmart to donate their returned and excess inventory to nonprofits on a consistent basis. Every week, Good360 has full semi-truckloads that can be delivered directly to your location. DO YOU NEED EVERYDAY ITEMS TO SERVE YOUR COMMUNITY? You should know about Good360’s Walmart Truckload program. Request more information about the Walmart truckload program. To receive Walmart truckloads, your organization must be an approved member of our Direct Truckload Program. Complete the form below to have a member of our team contact you with further details.